Here are the 2018 dog-gone winners of last weekend's Spooky Pooch Parade. Thanks to all the amazing dogs that participated. Best Senior in Costume was the UPS pooch. 13-year-old Bella, a Pomeranian and Shih Tzu mix with Sonny Khurana from Lombard. Best Costume Overall was the funeral procession with Jolene and Toot, English bull terriers, and Matthew and Carla Owens from Chicago. Best Horticultural Interpretation was Bella and Londynne, the Maltese/Yorkie and Shih tzu, as bees, flowers and their human gardeners Jennifer and Zach Negrete and Katie Betcher from Chicago. Best Dog/Owner Costume was Bella, Pit Bull/Boxer mix as Cookie Monsters of the Midway with Ethan Pearson and Sara Barto of Glenview. Best Puppy in Costume was Brooklyn, 9 months, as a fairy pup with Alexandra Gerber. For two very special hours only, dogs are allowed in the Chicago Botanic Garden. Cleverly costumed canines march the parade route to celebrate Halloween. Spectators are invited to line the parade route for a barking good time. Note: Viewing the dog parade is free. 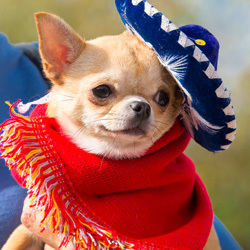 If you are bringing a dog, however, you must purchase paid registration for your dog, whether or not you enter the parade and costume contest. In addition to the parade, activities include the costume contest, judging, and an awards ceremony. 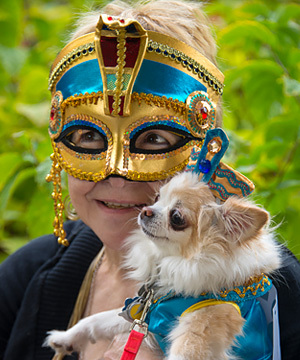 Costume categories include Best Costume Overall, Best Dog/Owner Costume, Best Puppy in Costume for dogs ages 1 and under in people years, Best Senior in Costume for dogs ages 10 and older in people years, and Best Horticultural Interpretation. Nonprofits and vendors from a variety of local pet supply shops will share information and sell dog-related products. The parade steps off from the Krasberg Rose Garden, where the activities and costume contest take place. Dogs must be on leash at all times and must leave the Garden by 2 p.m. Comply with the rules and restrictions of the Chicago Botanic Garden and the Cook County Forest Preserves. Assume the full risk of any and all injuries, damage and loss, regardless of severity, that may be sustained as a result of said participation, and to waive and relinquish, to fully release and forever discharge, all claims against the Chicago Botanic Garden and/or Cook County Forest Preserves as a result of participating in this event. Agree to be removed from the premises and/or the event without recourse if asked to by the Chicago Botanic Garden staff, Cook County Forest Preserves, or other policing body. Allow the Chicago Botanic Garden and its designated agents and assigns and anyone publishing under its authority to create, reproduce, and distribute any images of you or your dog’s participation in the Spooky Pooch Parade. All dogs on-site must be current with appropriate shots and registrations. Dogs in heat or aggressive animals may be removed from the Garden at the discretion of the management; no refunds. No dogs will be allowed in the Garden after 2 p.m. and all dogs must be on a leash at all times. Spectators are invited to line the parade route for a barking good time. ALL dogs on-site must have paid registration for the event whether participating in the parade or not. The event is held rain or shine and no refunds will be given based on weather. Tickets to this event are nonrefundable. Due to the popularity of this event, we encourage you to buy tickets in advance. A confirmation will arrive via email once your order is received. Tickets are on a first-come, first-served basis. Space is limited. Advance tickets may also be purchased at the Chicago Botanic Garden Information Desk in the Visitor Center. Event will occur rain or shine. For questions, please call (847) 835-5440. All sales are final, no cash value. Noon to 12:30 p.m.: Parade. Judges deliberate and decide winners.